The Comox Valley Curling Club is thrilled to announce the Battle of The Breweries Keg Curling Fundraiser! This is a special spectator friendly and fans participation event on Saturday, March 23 at 8 PM. For the first time anywhere (as far as could be verified! ), actual beer kegs will be curled on the ice in a real curling game between breweries. 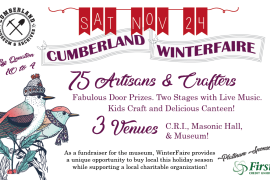 Cumberland Brewing Company, Forbidden, Gladstone, and Land & Sea will face off in this ridiculous fun new event! In the spirit of craft brewing, and curling for that matter, the rivalries are supportive and friendly. While each brewery is proud of the beer they produce, and their business is growing and competitive; our local beer craftsmen are appreciative and supportive of one another. Not so much on the ice! 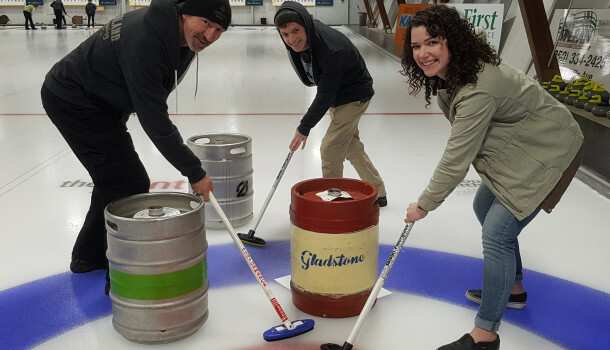 Darren Adam and Mike Tymchuk of Cumberland Brewing are regular curlers, as are Daniel Sharratt and Alexandra Stephenson of Gladstone Brewing. This is a chance for on-ice bragging rights! Don’t be surprised if the rookie curlers from Forbidden or Land & Sea upset the veterans! In addition to the fierce on-ice competition between the breweries, anyone in attendance at the club will be welcome to try shooting a beer keg themselves. For $5.00 a shot, anyone can try shooting a real beer keg down the ice. Whoever gets their beer keg shot closest to the button (center of the curling rings) will win an amazing brewery gift pack with beer, apparel and an assortment of sudsy prizes. 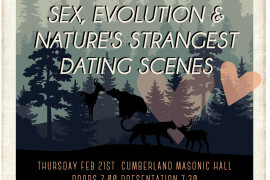 All proceeds from this event will go to Comox Valley Coldest Night of the Year in direct support of the CV Transition Society. Each brewery will also have at least one of their beers on tap at the Extra End Lounge at the club for spectators to sample. The Battle of the Breweries is part of the Saturday evening entertainment during the first ever Pros and Joes Funspiel. This is a brand new event that is specifically aimed to give new and less experienced curlers a taste of a weekend bonspiel. For the three days March 22 – 24 duration of the Pros and Joes, the CVCC will donate 50 cents from every pint of beer sold, as well as hold a 50/50 and other prize draws, all contributing towards this worthy and timely cause. via the CV Transition Society.